From DLVO theory we know that adding polymers to a particulate system can stabilize it . Frustratingly, if we add a little too much polymer, we can de-stabilize the system via a non-intuitive effect called Depletion Flocculation. To get a feel for the effect, play with the radius of the particles, the radius ("radius of gyration") of the polymer, its concentration and MWt. The key is the attractive energy at short distances. If this is large (negative) then it is likely to overcome whatever steric or charge stabilization is available. Still confused? Well, most of us are, and we have two models here to add to the difficulties. But depletion flocculation is a very significant effect in real-world formulations, so it's worth trying to understand what is going on so you can avoid the problem. An extra attractive force not included in DLVO arises when a polymer that has no attraction to the particles is added to the dispersion. At first it is hard to see why a polymer that does not interact with the particles can have any effect on them. If the polymer is attracted to the particle then it can cause steric stabilisation at high concentrations and bridging flocculation (it attracts two particles and therefore brings them together) at low concentrations. 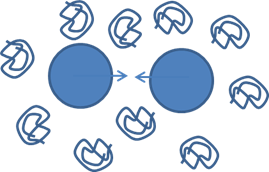 The explanation of depletion usually involved a diagram showing the polymer chains as little spheres that are unable to get close to the particles when, by chance, the two particles happen to be near each other. This means that there is a high concentration of polymer in the bulk and a low concentration between the particles. This is a classic case of osmotic pressure difference and solvent will go from the low concentration to the high concentration, i.e. the solvent will flow out of the gap between the particles, causing them to clump. The graph on the left is from the classic Asakura & Oosawa model. That on the right (which includes steric stabilization) is from Vincent. The combination of the polymer concentration and MWt gives the "number density" ρ (in molecules/m³) of the polymer from which the osmotic pressure Π can be calculated via Π=ρkT. The value R in the formula is the centre-to-centre distance, but in the plot (as with DLVO) the distance is shown as the particle-to-particle gap, h. The formula is valid for when h<2δ - above this the polymer is able to enter the gap and there is no osmotic force. The graph automatically scales in the x-axis to just above 2δ. The attractive depletion energy, Gdep, is calculated via the following formula, with G plotted in units of kT in the graph. The downside of A&O is that there is no term describing the stabilisation effect at high concentration (nor does it show steric stabilization effects if the particles are covered). Still, A&O is good enough to look at the typical attractive effects seen at lower polymer concentrations. First play with the inputs and see the effect, then read more details below. The first obvious problem for the user is to know the effective radius of the polymer. Classically this is the radius of gyration Rg plus whatever extra shell is provided (e.g. a Debye layer as in DLVO). The usual approximation is that Rg²=Nb²/6 where N is the number of polymer bonds and b is a "bond length", though N and b are more to do with "statistical bond length" rather than actual bond length. Feel free to use or ignore the calculation in the app if you know your Rg via some other route. The second problem is that Rg and the MWt used to calculate the osmotic pressure are inter-related. Again you have to sort this out for yourself. The third problem is knowing whether your polymer is completely unable to interact with the particle (a key assumption behind the theory). If this is true (e.g. both polymer and particle have the same ionic charge) then the calculation is OK. But if the polymer has a modest affinity for the particle then any flocculation is likely to be of the bridging type - or if the polymer level is large and it is well-attached to the particle then you get steric stabilisation as in DLVO. The fourth problem is alluded to above. You need a reasonably high concentration of polymer to get a significant osmotic pressure to drive the flocculation. But at even higher concentrations stabilisation can set in for complicated reasons. Finally, don't blame me that there are so many uncertainties behind even this "simple" model of depletion flocculation! The key issue is that if the stabilizing polymer was completely covering and impenetrable then we just have a larger particle. Otherwise, the free polymer can mix with the grafted one, giving an overlap, p, and also the grafted one might shrink by q, given the presence of the free. Although steric stabilization provides a huge barrier against flocculation, as the calculations show, it is easy to get a negative energy well that can provide significant (but with luck temporary) flocculation. 1S. Asakura and F. Oosawa, Interaction between particles suspended in solutions of macromolecules J. Polym. Sci., 33 (1958) 183-192. 2Andrew Jones and Brian Vincent, Depletion Flocculation in Dispersions of Sterically-Stabilised Particles 2. 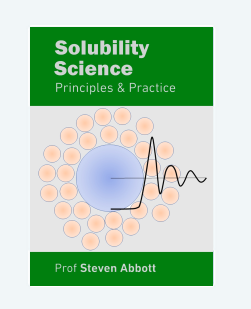 Modifications to Theory and Further Studies Colloids and Surfaces, 42 (1989) 113-138.